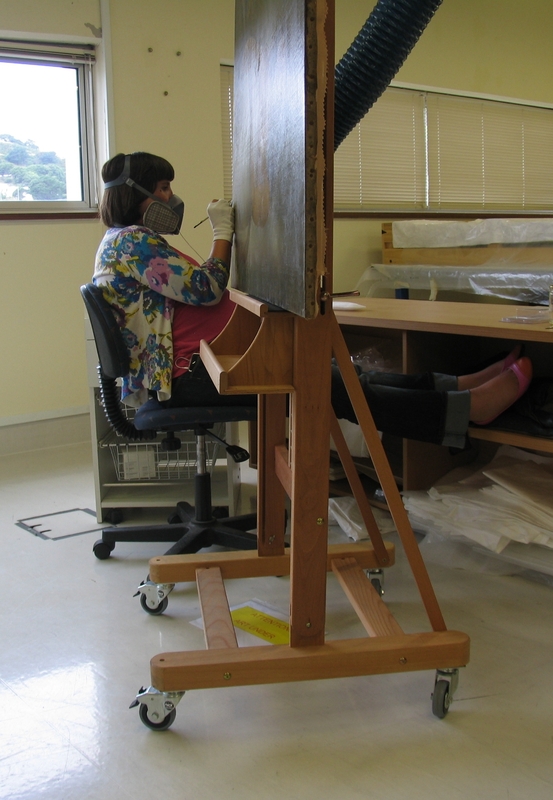 One of the most rewarding stages of the treatment is the varnishing of the painting. The new varnish layer returns the colours of the painting to the saturation and depth which were intended by the artist and it is when we feel like we are on the home stretch of the treatment! We use a synthetic resin that was specially created for the conservation profession, which has very similar optical qualities to the natural resins that John Webber would have originally used. It has favourable ageing characteristics, yellowing much less than the natural resins and remaining easily reversible with age. The first layer of varnish was brushed and as can be seen in the photograph below, the change was dramatic. The early stages of the brush varnishing of the painting. Photograph taken by Katherine Campbell, © Te Papa. Once the varnish has dried and hardened the next stage of the treatment can begin. Retouching, also known as inpainting, is carried out in areas of loss and abrasion, with the aim of reintegrating these areas so as not to draw the eye of the viewer. We want you to see the beautiful painting, without the distraction of areas of deterioration. We take care not to cover areas of original paint, our aim is not to return the appearance of the panting to its original state or make it look-like-new, the natural signs of age are retained and returning the appearance to the artist’s original intention is our aim. Retouching along the bottom edge of the painting (with my feet up!). Photograph taken by Matthew O'Reilly, © Te Papa. Once the retouching was complete a final spray varnish layer was applied to ensure an even level of gloss and saturation across the surface. The painting was returned to its frame which has also undergone restoration that Matthew will be blogging about soon. After just over a 12 months work, the treatment of Poedua is finally finished. The painting will be put on display in Toi Te Papa on level 5 this week and we hope you get a chance to come and see it soon. 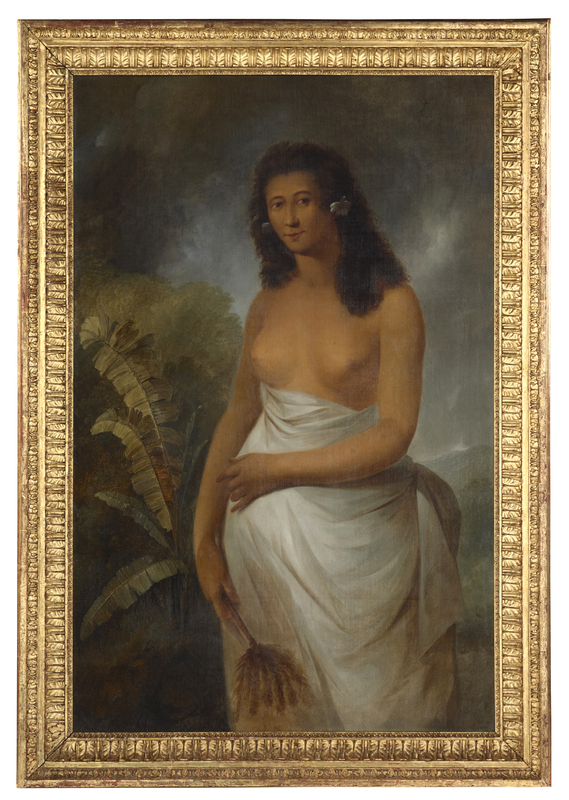 2010-0029-1; Poedua (Poetua), daughter of Oreo, chief of Ulaietea, one of the Society Isles; 1785; Webber, John. After treatment. Photograph taken by Kate Whitley, © Te Papa. Katherine and I have enjoyed keeping you up-to-date with the treatment of this painting and hope that you have enjoyed it too! 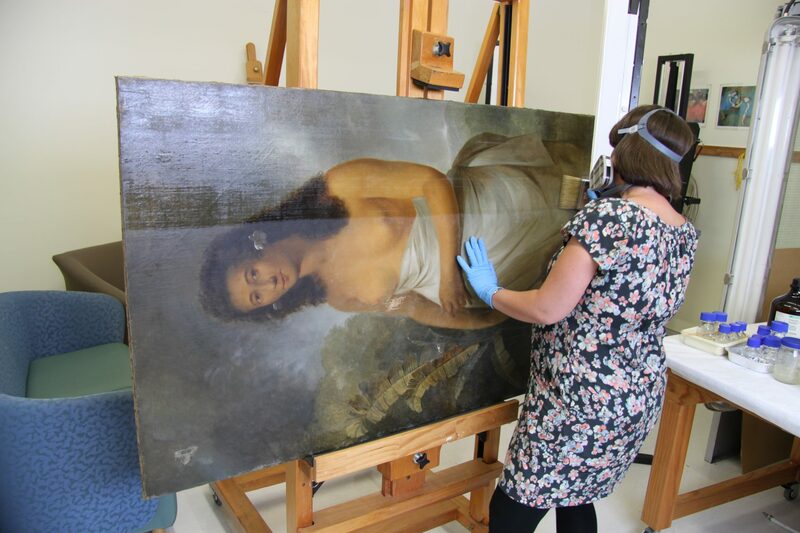 We will continue to blog when exciting things come through the paintings conservation lab that are worthy of sharing with you! What an amazing difference in the clarity and colours of the painting. Does a team work on it or just one person from start to finish?